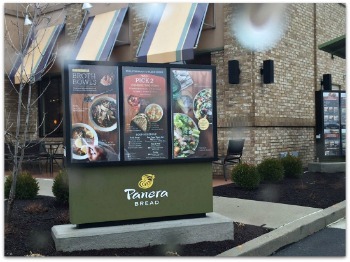 Just a shout out to thank Panera Bread located @ The Streets of West Chester. Thursday’s weather was miserable (yes the pictures do show pouring rain) and I was suffering from mid-day starvation and had no time to stop and eat. Thankfully, my Panera has a drive thru plus a healthy menu– so I was saved from fries and a burger. Anytime I can a great meal, stay dry and stay on schedule is a great day. And the mom, in line behind me, with 2 kids strapped into car seats obviously saw the advantages of the drive thru too. Just love it when local restaurants make my day!